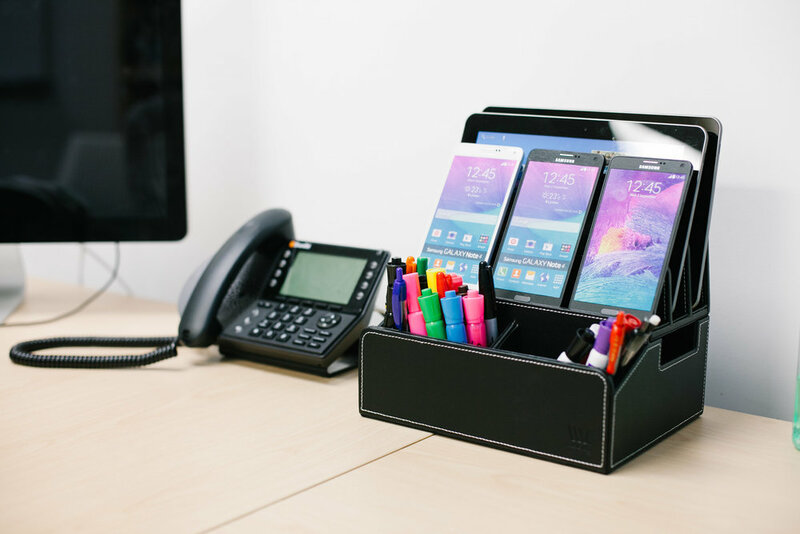 When the new MobileVision 10 Port Executive PU Leather Docking Organizer is paired with two of the Powermod 5-USB Chargers, it creates a truly universal 10 port USB Charging Station. This is the largest and only PU leather charging station of its kind. It is the ideal solution for keeping 10 or more gadgets conveniently charging in one place. Use the station's wide and deep base to hide all cables and the 2 Powermod Chargers included. Each Powermod 5-port USB Charger allows you to power up to 5 devices at one time and provides a maximum of 8 Amps (up to 2.4A per USB port). More than enough power to charge multiple tablets and smartphones. (Charging cables sold separately.) With the stand’s solid dividers, the 10-port Executive Charging Station can support up to 9 tablets and 3 smaller devices like smartphones and more. This is the best and only 10 Port charging station in luxurious PU Leather for use in classrooms, restaurants, hotels, and households with multiple tech devices. Sleek and professional design is also perfect for corporate offices and meeting rooms.